Dignitas is a responsive and modern theme, light colors and space for customisation. This B&B WordPress Theme is suitable for hotels, apartmants, spa resort, B&B, and travel agency. 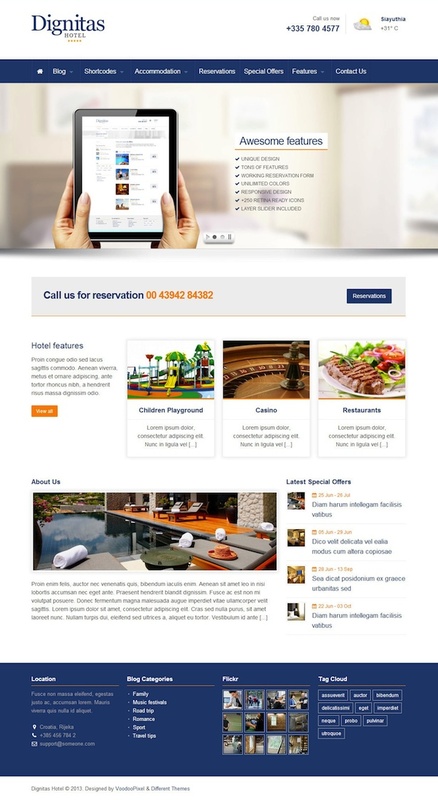 Features include featured slider, online reservations form, social media icons, local temp, rooms feature, hotel amenities, unlimited colors, photo gallery, weather forecast, Google Fonts, Google Maps integrated, Special Offers page, Banner Management, shortcodes and more.